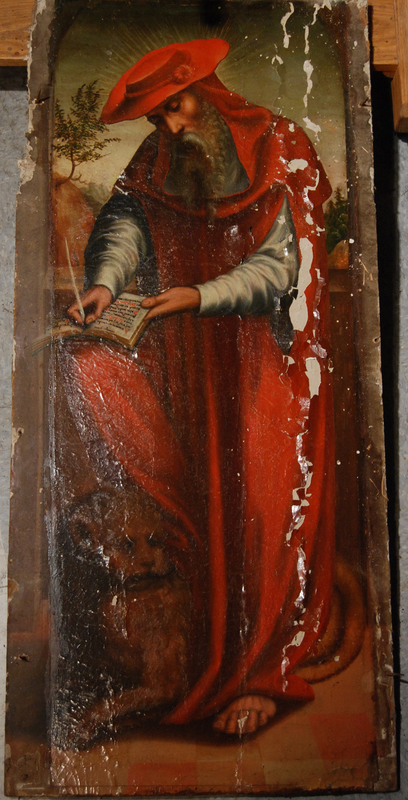 The panel painting of St. Jerome was treated in 2008 along with its flanking panel of St. Francis of Assisi. It is part of a historic altar piece that was passed down through the family of Christopher Columbus. It now resides in central Pennsylvania where it is on view to the public at the “Columbus Chapel and Boal Mansion,” in Boalsburg, Pennsylvania. This panel painting may have been owned by Christopher Columbus or by his direct heirs. This collection is thought to be the most important and extensive collection of Columbus artifacts archives in North America. The chapel was part of the Columbus Castle in Asturias, Spain, and was inherited in 1908 by Mathilde de Lagarde Boal from her Aunt Victoria Columbus and brought to the United States in 1909 by her husband, Colonel Theodore Davis Boal. 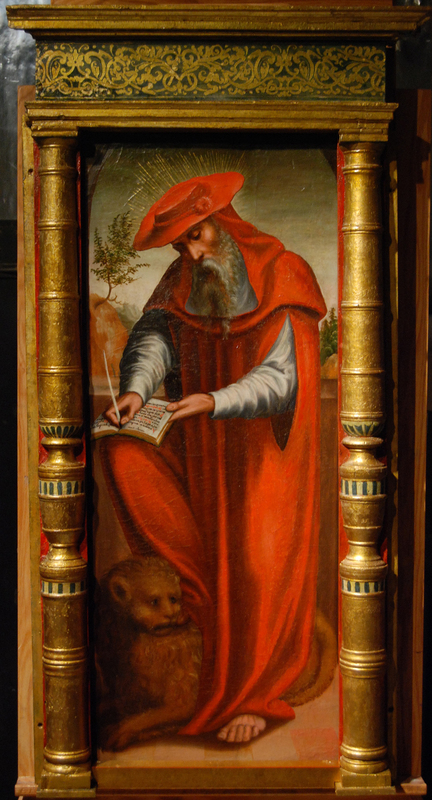 The panel painting is thought to be Italian in origin and dates from the late 15th c. to the early 16th c. The frame dates from the late 16th c. or early 17th c.
St. Jerome (Eusebius Sophronius Hieronymus) was born in the year 347 in the town of Stridon in the Roman province of Dalmatia. He died near Bethlehem in the year 420. He was a Roman Christian priest, confessor, theologian and historian. He translated the Bible into Latin and part of the Hebrew Gospel into Greek. He is frequently portrayed with a lion in paintings or drawings. 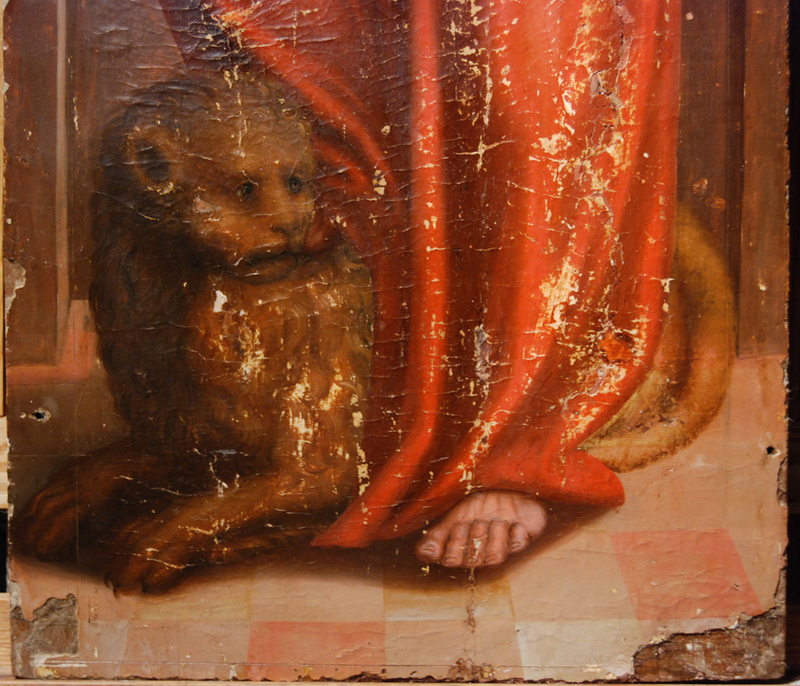 The legend states that a lion wandered into his monastery, all fled but St. Jerome. The lion came to him with a thorn in his paw which he removed, Jerome bandaged the paw and instead of leaving, the lion lay down and stayed to protect the monk. The painting was created using a medium-rich, finely ground oil based paint applied over a fine white, now somewhat yellowed, ground layer. There was a thick white ground layer below the first ground layer applied directly onto the wooden panel. The panel was made of a pine and its grain is vertical. The overall size of the panel was 44”h x 20 3/16”w and varies from ½”th on the viewer’s right side to ¾”th on the left. Because there were hand-forged nailes driven through the painting into the frame, the panel had not been allowed to freely expand and contract with changes of humidity and temperature. Humidity levels remaining low enough for an extended period of time would cause a wooden panel to permanently shrink. This was what happened to this panel resulting in several vertical cracks. The painting was made up of two planks of wood joined vertically with a tongue and groove joint. The right panel was bowing convexly towards the viewer. The panel had cracked along where it was joined and in the right plank. Because of this the paint was tenting, flaking and actively delaminating between all layers of original ground and paint, and restorers fills and overpaint. This painting had been restored at least two or three times in the past in order to repair the continuously flaking and tenting paint. The panel support originally had three tapering dovetailed battens installed on the reverse side, which helped to keep it flat. Only the middle batten remains. When the surface of this painting was tapped lightly with your hand it sounded hollow in many places. This meant that the paint layers were not well attached to the panel below or to each other. 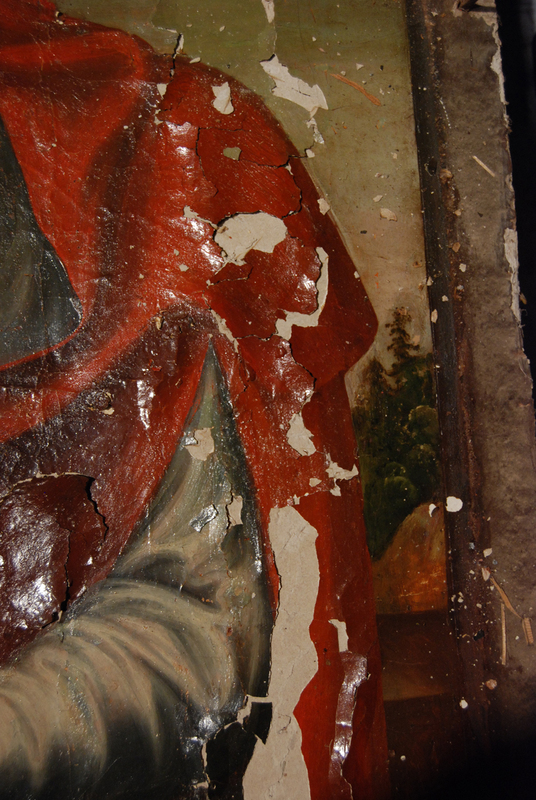 This was exacerbated by the multiple layers of restorer’s fills and overpaint on top of the original painting. 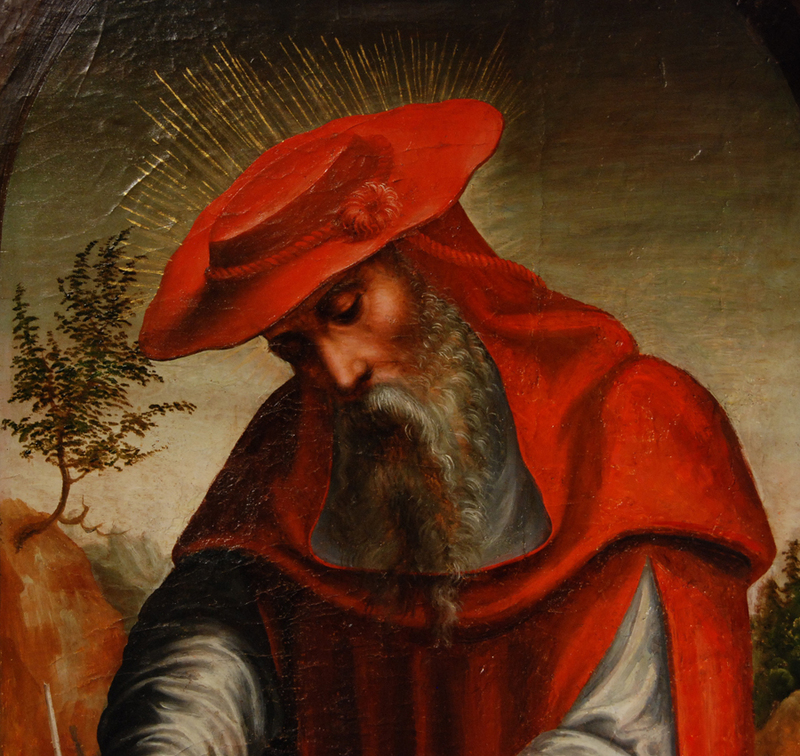 St. Jerome’s red robe was almost completely overpainted. The filling materials were often forced in under tented paint as a means to secure the original lifting paint rather than relaxing and reattaching the paint back into plane. Lifting paint was also reattached on top of the paint next to it because when the panel shrunk there wasn’t enough room to always set the paint back into place. This resulted in a great deal of loss of original paint, damaged original paint, and original paint on top of other original paint. In addition, three or more layers of discolored natural resin varnish were present on top of or between all of these layers. 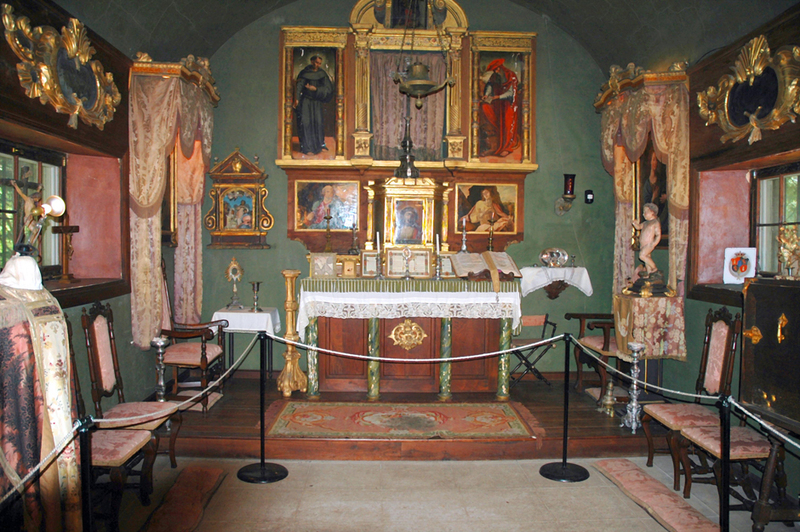 The frame was most likely added when the chapel altar was moved from either Portugal or Italy to Spain. The paint and gilding on the frame was actively flaking. It was dirty and much of the gilding had been overpainted with metallic paints. The four sides of the frame may have originally been nailed directly onto a plaster wall. When it was removed from Spain and re-erected in Pennsylvania, there was nothing to hold it together. Modern 20th c. pieces of wood were added on the back to hold it together. 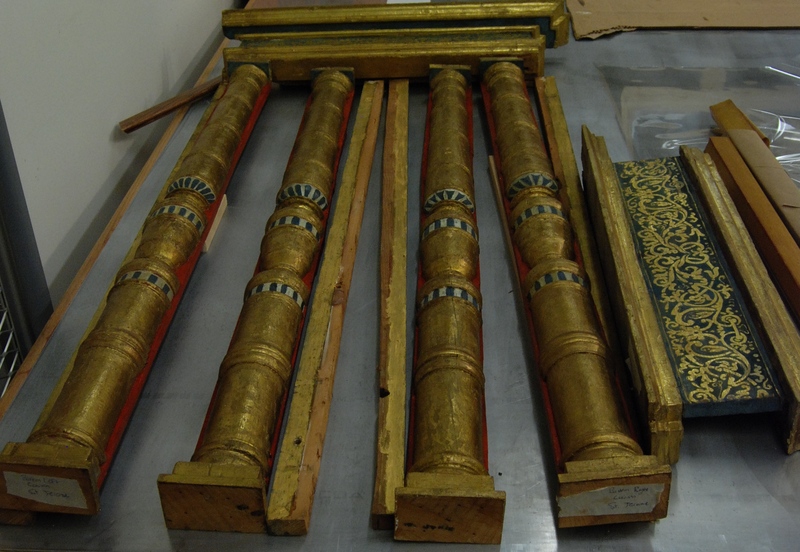 These all need to come apart to enable proper conservation of the painting and this frame. The surface of the frame on top of the metallic paint is very dirty. The original frame’s surface was also quite dirty as seen in areas were the metallic paint has flaked off. The painting was carefully removed from the wall above the altar table in the Columbus Chapel and was transported to our conservation facility in Pennsylvania. All aspects of the treatment were documented in writing and by digital photography. In order to safely unframe this painting, a dozen two inch hand-forged nails, firmly imbedded through the painting into the frame, needed to be removed. They could not have been pried out from the back by putting leverage on the panel because of the fragility of the paint. The nails were carefully cut by inserting very small fine hacksaw blades and nippers between the frame and the painting. Once removed, it was discovered that 2” of painted image on all sides had been covered by the frame. Since the paint had been so adversely affected by panel shrinkage we placed the panel in a monitored humidification chamber kept at 75% relative humidity. This process was somewhat successful in that the panel expanded slightly, but not enough to fully allow the paint to set down. After humidification the panel was examined to ascertain how much of the paint was separated from its support. It was found that approximately one third of the paint was not well adhered, much of which was not tented, but just loose. Detached sections were consolidated by injecting diluted hot hide glue under the paint with a surgical syringe. This also consolidated cracks in the panel support. Heat was applied to the surface of these areas with a small tacking iron. Some of the tenting paint set down easily and other areas would no longer fit. One side of the tented paint chips needed to be slightly pared down in order to allow them to be reused without losing the piece in its entirety. This consolidation process needed to be repeated 6 or 7 times until all loose areas on the panel were securely reattached. The discolored varnish layers and restorers overpaint were removed with aqueous solutions and organic solvents. After cleaning, the painting was given an isolating spray varnish coating. Losses were filled with gesso and individually coated with varnish. 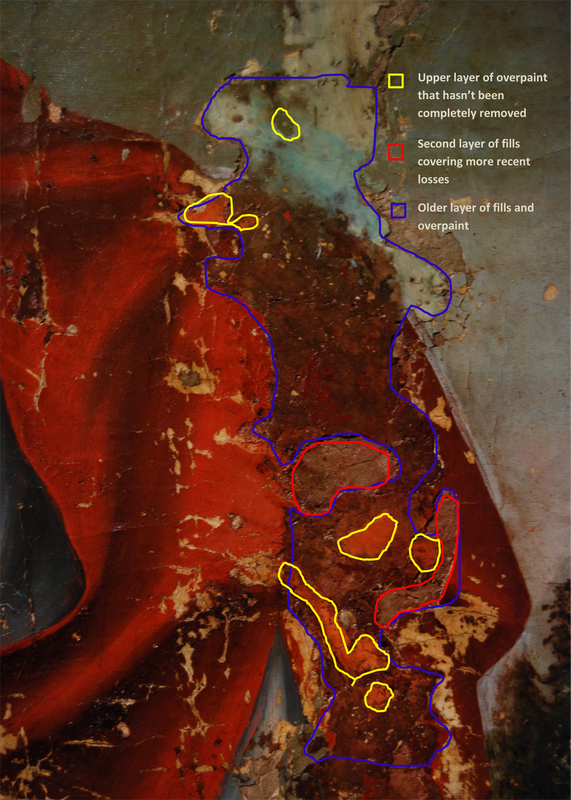 Abrasions, losses, and fills were inpainted with conservation grade paints. The painting was given a final coating of varnish. The frame was in four distinct pieces following its removal from the painting. The flaking gilding, paint and overpaint were consolidated with varnish. Once stabile, the overpaint, dirt and surface grime on the frame were removed with organic solvents and then mild detergents. Each piece of the frame was coated with varnish. Losses were filled, then inpainted with conservation grade paints and mica powders, and in-gilded with gold leaf. A new backing support needed to be created from wood on which the frame was reassembled so that the painting could actually be placed into the frame rather than the four frame sides attached to the artwork. Once the frame was reassembled, the new backing was painted with mica powders to match the gold leaf of the frame. The painting was properly reframed so that the panel painting had room to expand gradually as the seasons changed. It was returned to the chapel and reinstalled above the altar.